Mumbai: Blackworld Communications Studio, a leading Events & Experiential firm has set up Voxxeltek, a global company with insights into cutting-edge, current and future tech. 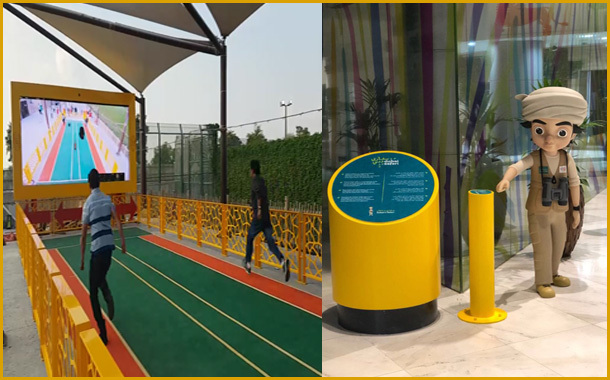 In one of their projects, Voxxeltek has developed unique experiences using emerging technologies for Dubai Safari Park. Dubai Safari Park is a project by Dubai Municipality, spread over 119 hectares and will provide the best habitat for wildlife – the new home for more than 2500 animals from all over the world. It aims to be one of the top ten zoos internationally. In today’s competitive age, brands are moving towards more customer centric experiences. New age technologies have bridged the gap between traditional models to engage with consumers, by introducing platforms such as Virtual Reality, Augmented Reality, Mixed reality, Internet of Things, Touch Technology, Motion & Gesture Control, 3d Projection Mapping & Holographic Projection, Facial Tracking, etc. Sultan’s Safari: Sultan’s Safari is an Augmented Reality application available both on the Play Store and the App Store, for exploring the Dubai Safari Park in an interesting way. Cheetah Chase: Cheetah Chase is a lovingly crafted descent into the world of Augmented Reality. It is an immersive, engaging and downright fun multiplayer experience you’ll find in AR right now. Kids and adults alike can race themselves with a Cheetah, Hippo, Elephant, Moon Bear and a Komodo Dragon on a 10-meter race track. Interactive way finding map: The map is a 3D application available on the Play Store and the App Store that helps visitors with continued navigation through the park. It is an interesting way to browse the park and get around different enclosures, exhibits and amenities, the map ensures you are not lost and can find what you are looking for with great ease and comfort. Monkey Face: Monkey Face is a face morphing application that gives visitors an opportunity of seeing themselves as a Mandrill, Gorilla or Chimpanzee. Monkey Game: Monkey Game is a kiosk-based experience that visitors can play and test their memory with that of a monkey. Commenting on the same Mr. Trevor Pereira, CEO, Voxxeltek says, “Voxxeltek is working towards creating and building technologies that can improve lives and transform businesses. Our aim is to help enterprises disrupt existing markets by creating path-breaking offerings. Our work will directly impact people across every sphere, be it work, education, informal interactions, consuming content, entertainment and healthcare to name just a few. It has the potential to alter daily lives, in an enriching, engaging way. Our projects at Dubai Safari Park are experiences designed with a tech layer incorporated within it. Cheetah Chase – the AR run with animals is a very unique experience created through an amalgamation of the best hardware and software. We worked with the world’s most reputed camera and component companies to create a sensational AR/IOT project. Founded by Trevor Pereira, Mohan Naik and Ami Pereira, Voxxeltek is a global company with insights into cutting-edge, current and future tech that renders services and builds products in the realm of emerging technologies.